KPowersave is now among SUSE Linux, Debian, K/Ubuntu, Mandriva, Slackware, ALT Linux, Arch Linux, Fedora Core 4/5 and Gentoo available on two additional distributions. On FoX Desktop 1.0 Professional (a Fedora based KDE distribution) KPowersave and powersave are the default powermanagement solution (see Release Notes). KPowersave (and also powersave) is now available in the development tree of PLD Linux. You can download the package from the 3.0 tree of the ftp server. 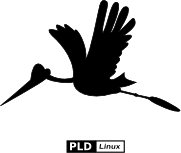 PLD Linux is also a former RedHat based polish distribution.